While the US military continues to build more advanced unmanned aerial vehicles (UAVs), popularly known as Drones, the US company Battelle has developed a shoulder-mounted rifle to deal with unwanted drones flying around. Dubbed DroneDefender, the revolutionary weapon specifically designed to target and knock drones out of the sky at a range of just 400 meters, without totally destroying them. The Battelle DroneDefender utilizes radio waves to neutralize in-flight Drones and force them to land or hover or return to its point of origin. You can watch the video given below to know how the DroneDefender works. It shows how the weapon is able to stop a drone in its tracks and cause it to land. The DroneDefender weighs less than 5 kilograms and can disable a hostile drone within a 400-meter radius. 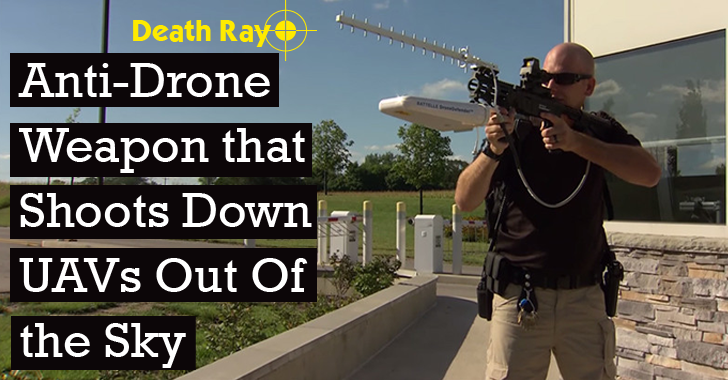 As soon as the trigger is pulled, DroneDefender emits radio pulses that interrupt the communications system of the drone (both drone and GPS signal it sends out) and makes it think that it gone out of range, thereby preventing the drone from accepting any additional commands from its operator. Also Read: How Hackers Can use Radio-waves to Control Your Smartphone From 16 Feet Away. The drone then enters into its safety protocols that force it to either hover in its position or slowly prepares to land, or return to its point of origin. This isn't first drone weapon specially designed to shoot Drones. Some companies made drone-neutralizing devices before, but the Battelle DroneDefender is the first device that is able to knock UAVs out of the sky without purposefully damaging it. DroneDefender is particularly useful when any drone is found equipped with an improvised explosive device. "The DroneDefender can help protect us from those who may wish to do us harm," said Dan Stamm, who led the research project. "It can help us in numerous settings, from the White House lawn to bases and embassies overseas; from prisons and schools to historic sites. It easily and reliably neutralizes the threat." This revolutionary gun is believed to be "effective against all commercial drones in the United States," Stamm said. Battelle is a major US government contractor that regularly makes scientific breakthroughs and discoveries. The company expects to make DroneDefender available to US federal agencies by next year.